The UniDAQ system is a versatile data acquisition and processing system, optimized for higher channel count applications. It combines analog interfaces, signal processing, memories, safety features, power supplies, and communication ports on a single, easy to integrate, board. A versatile data acquisition and processing platform for industrial applications, scientific research and education. UniDAQ boards are available with high-resolution data converters for acoustic and vibration measurements, and with low-latency SAR (succesive approximation) converters for control loops. Both systems use simultaneous sampling and provide excellent static and dynamic signal resolution. A floating-point DSP (digital signal processor) is used to scale and filter the input signals, equalize non-linear sensor characteristics, and provides ample processing power for complex control algorithms. Optional ARM+DSP processor variants are available to conveniently handle user-interfaces and web frontends without sacrificing signal processing real-time constraints. UniDAQ provides multiple configurable internal and external trigger options for the ADCs and DACs: hardware inputs, software-generated events, and synchronization signals from real-time networks. The Expansion Port lets you add mass storage devices like SD-card or eMMC for data and event logging, a user interface consisting of an LCD display, touchscreen and keypad, or GPIO ports. 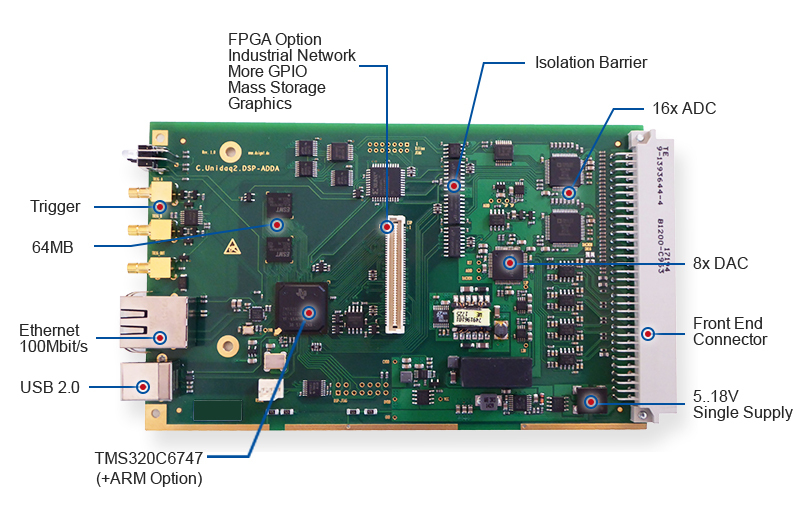 A parallel bus interface and a high-speed SPI port are available to connect external controllers or an FPGA for encoder interfaces (EnDAT, BiSS), PWM outputs, and real-time fieldbuses (EtherCAT, ProfiNet, CAN) for production environment integration. UniDAQ supports the integration of simulation tools and engineering software like Matlab/Simulink® and LabView® with NI-Visa USB RAW and Modbus-TCP data transfers. Besides signal analysis, stimuli generation and modelling, this also enables an efficient development of stand-alone applications: algorithms can be evaluated, ported to the DSP, and verified step-by-step. The extensive support software contains sample configurations and demonstration programs for a variety of application areas. It is fully integrated into Texas Instrument's Code Composer Studio development environment. The board firmware also includes ready-to-use functions for in-the-field software updates and diagnosis via a USB connection, optionally via Ethernet. The UniDAQ system can be used in 3U-19" systems as well as in tabletop and handheld devices. Please refer to the datasheet for mounting options. Electrical isolation of analog and digital circuits, combined with robust overvoltage-protected inputs and outputs simplifies system integration and guarantees signal integrity and reliability even in harsh industrial environments. The analog inputs and outputs accept industry-standard +/-5 and +/-10V levels. Many sensors however require additional signal conditioning.